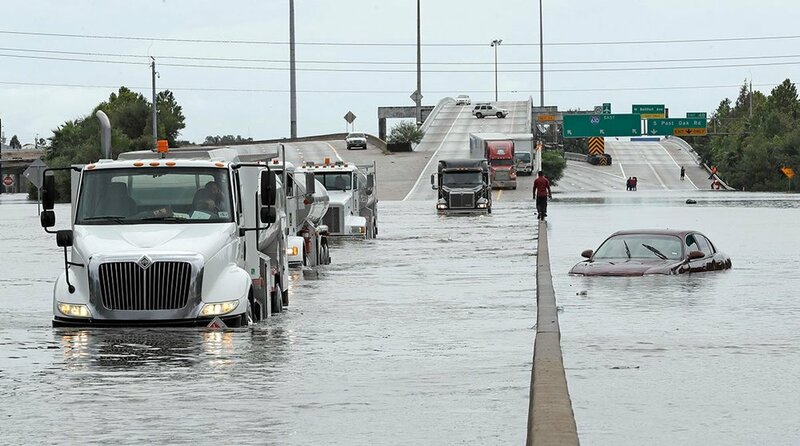 Cleaning up after the hurricanes — MacKay & Company, Inc.
No sooner had the rain stopped falling in Houston after Hurricane Harvey finally made his way out of the area than we started to get queries about what we thought the effects of the storm would be on the truck aftermarket. The pace of queries quickened as Hurricane Irma did her dirty work in Florida and the southeast. We will start by saying that thoughts of the effects of the storms on the truck aftermarket were not on our list of concerns as the news emerged from Texas and Florida. Getting help to all those afflicted by the storm was. But now that the waters have receded and the damage assessments begun, we can take a look at what lies ahead. The first task will be to estimate how many of the storm damaged vehicles can be repaired. Water damage is particularly nasty because it can affect all parts of the vehicle internally and externally, as well as in both the short and the long term. Salt water damage usually renders the vehicle unfixable. This is more likely to be a problem in Florida than in Texas. Repairing flood damage is an uncertain venture. Any vehicle that has sat in water for any length of time will have a severely compromised drive train. Engine and transmission repairs will involve a lengthy list of parts. Fluids, such as engine oil, transmission fluid, brake fluids, and coolants, are all vulnerable to damage from water and will have to be replaced. The brake system of a vehicle that has been submerged is unlikely to have survived without damage. Brake shoes, drums, pads and their associated parts will probably have to be replaced. The interior of a submerged vehicle will have to be carefully inspected. While the fabrics might have not been damaged, mildew will grow (one of the long-term problems we referred to earlier) and leave an unpleasant odor for as long as the vehicle is operating. The other component of the demand for truck parts is that stemming from the increased use of the vehicle stock that escaped the flood damage. Among the first images we saw in the aftermath of the storms were of people piling the water-soaked contents of their homes out on the curb for removal. Trucks had to come around to do that. And those trucks are going to reach their routine maintenance mileages more quickly than had been anticipated. The same is true for the truck fleets that will support the repair and rebuilding activity that will be going on for months, if not years, in the storm-affected areas. Lastly, many of the vehicles that were destroyed are going to be replaced. As those units come into operation they will generate their own demand for parts. The combined effect of all of this should be a short-term spike in parts demand in the storm-affected areas as vehicles get repaired. Over the longer term, vehicle usage will, again, dictate parts demand.